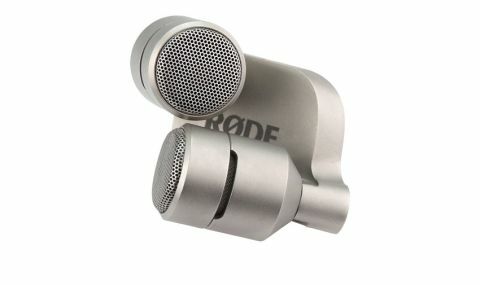 Want a studio-quality, stereo mic for your iPad, iPhone or iPod touch? This is it. Good quality recordings. Rode apps are impressive. 30-pin not a robust connection. Watch out for handling noise. Near-coincident pairing is an oft-used mic'ing technique for stereo recordings: two identical cardioid mics put close together, pointed at 90 degrees across one another. Now, shrink that whole principle down into one housing and attach it to your iOS device: et voilà the iXY. "The dual cardioid capsules are similar to those found on Rode's £399 NT4"
The metal body and casing feels of very high quality, with dual cardioid capsules similar to those found on Rode's £399 NT4. Spec wise, they're the same except for a maximum 120dB SPL handling, compared with the NT4's 143dB. The mic attaches via Apple's old-style 30-pin socket, which isn't a robust, pro audio connection, so do be careful with it. There is a Lightning connection iXY version in the pipeline according to Rode, however, or you can use this one with the relevant Apple 30-pin-to-Lightning adaptor. The iXY works with a wide range of iOS recording apps including GarageBand, but full functionality comes via the Rode Rec and Rec Lite apps (available from the App Store). There are recording quality levels up to 24-bit/96kHz according to the specs, and while the full app is £3.99, its features are impressive and dead easy to use: basic wave editor, separate high- and low-pass filters, compression, exciter and plenty of ways to share the resultant file. Issues to be aware of: iXY is a high-sensitivity condenser mic, so be careful of handling noise. Also, it's not good at isolating extraneous noise, so environment is everything. Nevertheless, while £169 might seem like a lot for an iPhone accessory, the iXY is more than capable of delivering pro studio-style results.